Fr Hunwicke's Mutual Enrichment: A NEW ORDER OF PENITENTS? I know it's a bit long, and rambles. The essence of it is the bits in bold print. Essentially, in this new Dark Age marked by a culture of ostensibly (for we can none of us know the conscience of another) unrepented mortal sin, we need to do whatever can be done to destroy the culture of Almost Inevitable Communion. You may have better ideas than I do about what, practically, can be done. But it seems to me that a basic starting point is the elimination of the Communion Procession. It creates an impression that everybody will receive Communion. It even puts pressure on people to receive communion when they have no desire to do so. In human terms, it is difficult to avoid a fear that it lead to sacrilegious communions. When the person who is directing the Communion gets to the pew in which a person is sitting, it may for some people be embarrassing to be the only person in the row who does not obediently rise and follow directions up to the Altar. We cannot be sure that we are not almost forcing people who may not be in a state of Grace to receive the Sacrament, and doing so, as I explained in an earlier part of this dissertation, in a changed situation in which there are entire categories of persons ('remarried divorcees', 'couples living together', 'Lesbian and Gay and Transexual couples') whose situation objectively contradicts the reception of Communion but who also, in my opinion, most certainly should not be made to feel awkward or odd or conspicuous if they refrain from communion. And the grim little shuffle up the church in a queue rather like the queue in the bank or supermarket, is just about the last thing that needs to be decked out with some bright new ritual 'significance', yet another ritual straightjacket. "Walking to the Lord together", indeed. What utter, utter, twaddle. But I've read it. I will conclude with a couple of historical observations, not because they enable me to try to prescribe details of a new praxis but simply because I think we need a wider general perspective on this matter than current praxis gives us. In the first millennium, in Ireland, there were innumerable 'monastic' sites. But who were the 'monks'? Burial sites have revealed to the excavator female and infantile inhumations as well as male. It seems that the term monk meant, not a person vowed to celibacy, but someone who was not living adulterously or promiscuously. Perhaps a hermit, but more probably a couple living in the bonds of Marriage. These people were thus, apparently, firmly distinguished from others whose lifestyle was not marked by evidence of chaste living. And there is evidence that, in the area surrounding the first millennium Irish oratories, there were different physical levels in which different categories stood to worship. Nearest to the oratory, the monks. Further away, penitents. You get the idea. Everyone in his Order. How about this for size: a down-to-earth practical system would be the distribution of Communion from the tabernacle before or after Mass; or, in big well-staffed churches, continuously during Mass in a side-chapel with a tabernacle. And with a presbyter permanently in the Confessional at the same time. Freedom! No regimentation! No grim shuffles up to the (extremely ordinary) Extraordinary Eucharistic Minister! The freedom just to walk around your Merciful Father's house as His free children during Mass, feeling completely at home and doing your own business, whatever it is! No need to feel that self-righteous people are staring at you judgementally! Regimented "seating" within the church? "But Father," some will cry out "that is discrimination! Are we not all equal before the Lord?!" Sarcasm aside, it sounds so ancient and yet so new. It would be interesting to see this put into practice. Where might one read more on couples refered to as "monks"? The (re)introduction of the Rites of Christian Initiation for Adults gives us a graduated Christian community, with people at various levels of sacramental union until at last they are 'in Communion', what you indicate is the logical counterpart, and the 'pastoral solution' for those whose union with the Church has become impaired. The present day assumption of perfect and absolute Communion of every baptised Catholic over a particular age is profoundly unpastoral; a one size fits all approach. Im also interested in these couples referred to as monks. In continental Europe it is usual for people who do not receive the Eucharist to sit near the back or to stand since there are usually few pews to begin with and even still there aren't usually extraordinary ministers of the Eucharist or well ordered lines for the Eucharist. Father, this sounds like a policy of despair. Since we cannot expect the Church to actually demand orthopraxy in connection with the distribution of Communion during Mass, let's see if we can at least divorce the Communion of the Faithful from its regular position in the Mass. Then all of those notorious public sinners the Church isn't calling to repentance will be less likely to make sacrilegious communions. What a sad irony that would be - that the liturgical deformation, which has wrought untold destruction in the name of 'active participation' by the laity, would ultimately culminate in stripping the most perfect manner of lay participation from the Mass. When I was a boy in the '40s and '50s, Mass was in the normal traditional Latin form (the NO had not even been thought of); all churches had Communion rails where communicants kneeled to receive Communion in the mouth. The congregation were seated in the normal pews, and when the time for Communion arrived, those who wished to receive walked to the Communion rail, sometimes via a small queue in the aisle on the same mission. There were always many people who did not receive Holy Communion, and I don't suppose any attention whatever was paid to this. Generally more people received Holy Communion at the earlier Masses, with few, if any, receiving at the later Masses.This was almost certainly due to the stricter fasting rules then in place. I think your post is spot-on, and if the older form of receiving Holy Communion at a Communion rail was revived,this would do away with the dangerous psychological pressure on everybody and anybody to receive, regardless of their state of soul. "32. It is also only fitting for us to recall the conclusion that can be drawn from this about "the public and social nature of each and every Mass." (28) For each and every Mass is not something private, even if a priest celebrates it privately; instead, it is an act of Christ and of the Church. In offering this sacrifice, the Church learns to offer herself as a sacrifice for all and she applies the unique and infinite redemptive power of the sacrifice of the Cross to the salvation of the whole world. For every Mass that is celebrated is being offered not just for the salvation of certain people, but also for the salvation of the whole world. 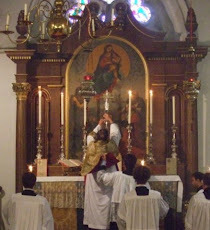 The conclusion from this is that even though active participation by many faithful is of its very nature particularly fitting when Mass is celebrated, still there is no reason to criticize but rather only to approve a Mass that a priest celebrates privately for a good reason in accordance with the regulations and legitimate traditions of the Church, even when only a server to make the responses is present. For such a Mass brings a rich and abundant treasure of special graces to help the priest himself, the faithful, the whole Church and the whole world toward salvation—and this same abundance of graces is not gained through mere reception of Holy Communion." You will no doubt provide us with the best interpretation, but at least for me this paragraph seems to say that one receives graces from assisting at Mass, standing, as it were, at the foot of the Cross, accompanying our Lord, with Our Lady, and that such graces in themselves are even greater than those received in Holy Communion. Thus the great benefit of just being at Mass, for those not disposed to receive Holy Communion. In those days when one had to fast from midnight if one was to receive the Eucharist, there were any number of gentle folk who did not receive the Eucharist owing to ostensibly having broken their fast. It was a fig leaf to be sure for some, but the pressure and compulsion to join the communicants' conga line was more easily avoided then, notwithstanding Graham Greene's Scobie having topped himself for his sacrilegious reception of the Eucharist in "The Heart of the Matter". Why not do away with pews then? As Mr. Ronan points out, a restoration of the midnight fast would help too; it simply means one may freely assume that another is not communicating because of the Fast. It would be nice if so-called "trad priests" raised this as an issue, even at the level of recommendation. Alas, I have never heard a regularized priest breathe a word about it, and nothing from an irregular priest about anything over three hours. In my humble, but considered opinion, the “communion as of right, regardless” is perhaps the biggest scandal of the post-Vatican II period. It has done more than anything to reduce or even destroy belief in the Real Presence, and the Ordained Priesthood. One way of dealing with this would be to re-introduce the three hour fast, or even, voluntarily, the fast from midnight. This would certainly reduce the number “trooping” up routinely, and with good and proper reason, since it would be difficult for some. The one hour fast is just daft. For my Sunday Mass, I can still be tucking in to my sausage, bacon, pancakes and eggs at 08.25, and be within the one fast for Holy Communion at the 09.00 Mass. Another thing is to get rid of all lay distributors. I deliberately do not call them “ministers” because there is no such ministry. Deacons or even acolytes can still be used if necessary to help out with the sick, etc. Holy Communion should not be given by, or received into, un-annointed hands! My intuition says that it would be right and proper if perhaps 40% of the congregation were to receive at any particular Sunday Mass. St Pius X would then rest more easily in his grave. But, and this is important, priests would have to get up in the pulpit on Sunday and explain clearly and specifically to the congregations,and lay distributors, why! Fr Hunwicke's suggestion is in fact perfectly traditional. The custom of giving Communion at Mass is a very recent introduction, but this fact has been entirely forgotten. As recently as 1910, for instance, at Westminster Cathedral, Communion was given between Masses in the Blessed Sacrament chapel, not at Mass. At St John's Seminary, Wonersh, until the 1920s, Communion was given to the seminarians only on Sundays, before an early Low Mass during which vernacular hymns were sung (yes, that's right) and the seminarians made their thanksgivings. They went to breakfast, and returned to the chapel for a High Mass later in the morning. There is certainly historical precedent for eliminating the Communion of the Faithful from publicly celebrated Masses, but I'm not sure that makes it traditional. While I do miss the altar rails, I don’t think their restoration, a longer fast or communion on the tongue, will solve the problem of ‘communion by rote’. What is needed – and has been for the past few decades – is preaching on the fundamentals of Catholic Doctrine. A series of homilies on the Sacraments, the Four Last Things, the reality of sin (Mortal and Venial, with examples…) and how sins can be forgiven: Contrition, Confession, Penance and Absolution. Attention needs to be focused on the Real Presence, as in: what it means and what our disposition should be in the Lord’s presence - both whenever we are in His house and especially when receiving Him in Holy Communion. The list is not exhaustive – merely a start. But it also entails leading by example - something many clergy are failing at today. I missed Jacobi's comment but would like to say this in his support. They are not extraordinary ministers this gives the word an entirely and deliberate obfuscation to the word. They are in reality "extra to the ORDINARY MINISTER". I wish also to add the reason given for them to suddenly appear; was it took so long to give "Holy" Communion after Vatican 2 to the mostly unshriven laity who now claimed the right to receive. These aide de campes were needed to distribute the Host, so we could get the whole reception over quickly. Then we threw out the reason given by the Council of Trent aside, it was described "of either kind alone", dismissing, and thus rendering foolish the reason for the reception of both Species and for these extras who just as suddenly appeared. The Council of Trent dismissed the habit and completely unnecessary the Lutheran teaching that the sacrifice was incomplete if we did not receive the Body and Blood. The reason for haste was set aside and communion took longer with more extras on the Altar to give out both species. How drolly infantile are those who do not accept Church teachings as Dorothy Sayers wrote their opinions are phantasms of their minds. I’d like to draw to your attention to an article about the journey of reconciliation or penance which is being discussed at the Synod on the Family (Instrumentum laboris 123). A third way that goes beyond the extreme positions of those who, on the one hand, would like to introduce radical changes in the Catholic doctrine and practice of marriage, by allowing the dissolution of the bond and a second marriage, and those who, on the other, adhere to a more "traditional" positions. This proposal is advanced in an essay by the French Dominican theologian Thomas Michelet, a doctoral student at the Theological Faculty of Fribourg (Switzerland), which has been published in the journal Nova & Vetera with the title "The Synod on the Family: The Way of ''Ordo Paenitentium." Fr. Michelet suggests establishing an "ordo paenitentium" for those who are in a persistent condition of incompatibility with the God’s law and embark on a journey of conversion that can last for many years or even a lifetime, but always in an ecclesial, liturgical and sacramental context that accompany their "pilgrimage." This proposed order of penitents is modeled on the sacrament of penance practiced in the early Church, in a renewed form. Although they are not able to receive the Eucharistic Communion, the penitents would not find themselves excluded from the sacramental life, because their journey of conversion itself is a sacrament and a source of grace. Surprisingly Fr I support you. I made a private arrangement with my parish priest ages ago to go to confession when no one was around during the week and go straight to the altar and I received Holy Communion. I had and still have, due I write because of the later verses in Ch 1 of Isaiah. Also because of the response to the Suscipiat Dominus. I wanted to make as perfect a sacrifice of charity that I could. After all is nit the Holy Sacrifice of the Mass a reenactment of the most perfect act of charity ever made? I also believe that Holy Communion should not be offered at mass but tied to confession in a ritual way. My Parish so long ago was ST Nicholas of Tolentine in Bristol. Canon Hayes whom I was more or less his pesonal altar boy, whom I besieged with questions about his behaviour, "Told me this, "Michael I am as Irish as many of them who come to this mass. I know they are hungover and have been fighting and other sinful actions. I will not by my actions condemn to hell by Giving Himself to them, therefore at this one mass there will not communion I will take it for them" Canon William Percival Hayes was a very good and strong priest. We used to have confession going on during daily Mass, right up to the Consecration. The line ups were quite long, as the church is downtown, where many people work, and who come for daily Mass, even though the church is not necessarily their parish church. I was quite sad when the new priest stopped that practice. He said was disrespectful to the Holy Sacrifice of the Mass, and so he stopped confessions stopped 5 minutes before the Mass began. Trouble is, confessions did not start earlier to compensate. It is so frustrating to be in a line up, and then, to be turned away. The visiting priests who took confessions did not seem to like the new rules, and one or two asked the Parish priest if they could continue with confession, but he said no. He has since left the parish, but the practice he has instituted remains. - removing the pews, to end the "row by row" mentality. The former would need high authority but the latter could be done by any parish priest. I'll just add my voice to those of the people who have already suggested restoring the longer fast as a solution to this problem. Anything which requires a degree of thought and discernment on the part of the would-be communicant is a step in the right direction, and, as people have said, it makes it much easier for people to avoid receiving if the longer fast provides a fig-leaf. Another thought: my fiancee has taken to only receiving at Masses where she can kneel, which rules out receiving at the Sunday morning Novus Ordo where she sings in the choir. In those cases she still goes up, but just receives a blessing. Maybe that would be a good middle way, as people could still "go with the flow" when everyone else was going up.